MBBS - Qualifications recognized by Pakistan Medical and Dental Council (PM&DC). 28 years on 01 May 2018.
equivalent in respective fields of specialties. Surgery, Thoracic Surgery, Urology and Cardiac Anaes. (PM&DC). Having completed minimum one year house job from institution recognized by PMDC, without house job can alsoapply. Note: ► Candidates qualified from Government Institutes shall be preferred. ► Appearing candidates can also apply subject to Hope Certificate issued by the concerned Institution. Such candidates must deposit their certificates/mark sheets alongwith PMDC Certificate to PA Directorate before 3rd week of March 2018, otherwise they will not be considered for selection / Induction in 1st Half2018. ► The age waiver will be granted from 28 to 35 years for GDMOs and 32 to 40 years for Specialists provided the required number of persons below the age of 28 to 32 years respectively are not available. c. Nationality Citizens of Pakistan and domicile holders of Azad Kashmir / Gilgit Baltistan. Upon final selection, candidates with dual nationality will have to surrender nationalities other than Pakistani. a. 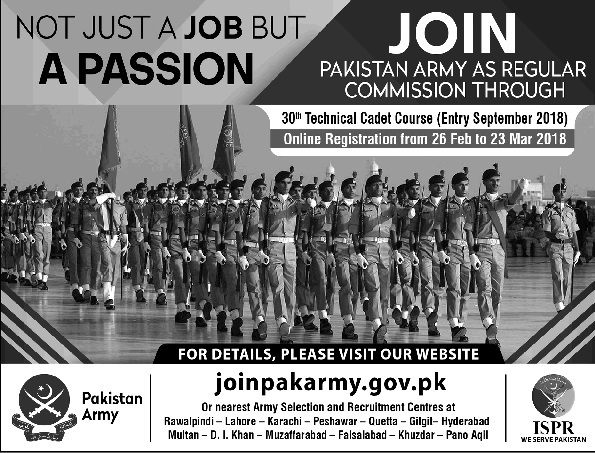 A candidate with specific higher qualification is eligible even if he / she is twice rejected by ISSB for PMA / OTS / JCA / Graduate Course or equivalent Naval / PAFCourses.